Welcome back to another Ultimate Recipe Challenge! This month, the prompt was BREAKFAST and so all the participants created Breakfast recipes to share. There are more than two dozen delicious entries this month.. sweet and savory, breads and proteins.. Make sure you scroll to the bottom of this post to see them all! 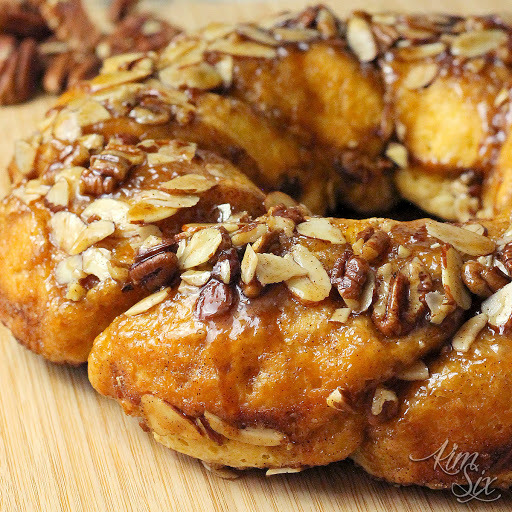 My entry this month was this decadent Maple Nut Sticky Bun Coffee Ring. The recipe is modifed from one of the annual Taste of Home cookbooks. The nut mix which is glazed in a combo of butter and maple syrup is the perfect contrast to the warm flaky laters of the pastry itself. And speaking of the pastry, it is actually made from refrigerated buttermilk biscuit dough. That means you can put this whole recipe together in less than 15 minutes. The flaky biscuit dough is soft and slightly salty compared to the sweet glazed nut topping. And the segments just pull apart if you don't have a knife handy. It is truly delicious. A super fast and easy recipe using refrigerated biscuits to create a beautiful and delicious sticky bun type pastry ring with a buttery maple nut glaze. All to cool for 1-2 minutes and remove from pan while still warm. The ingredient list is pretty simple, you don't even need flour! Add a butter/maple syrup mixture to the bottom of a greased bundt pan. Sprinkle on half of the nuts, sugar and spices. Layer on the biscuits. Add the remaining butter, syrup, sugar, nuts and spices. Bake for 15 minutes. The biscuits will puff up and get golden. Turn out of pan while the ring is still warm. In my opinion it is best when served warm, so if you aren't eating it directly from the oven, I would recommend microwaving it for a few seconds. It is so gooey and delicious. And the best part is just how quick and easy it is to make!